Dylan MacPherson is going back to Springfield. 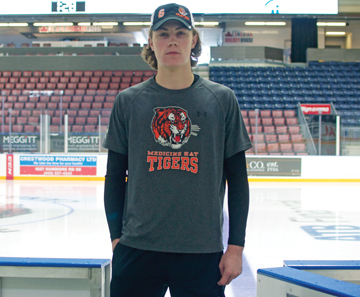 The 20-year-old Medicine Hat Tigers defenceman earned an amateur tryout with the American Hockey League’s Springfield Thunderbirds Tuesday and headed south with the goal of playing his first professional game with the club. MacPherson, from Redciliff, joined up with his hometown Tigers as a free agent in 2016 and before long emerged as one of the team’s top shut-down defencemen . He went on to compete in 186 games while wearing the orange and black. The Thunderbirds – affiliate to the Florida Panthers – have had their eye on MacPherson for a while. He earned an invitation to Panthers development camp last summer, then a trip to their fall camp before being shipped to Springfield for main training camp in September. The Thunderbirds host the Hartford Wolf Pack tonight. MacPherson set himself apart in the WHL as one of the league’s strongest skaters, something that likely drew eye of the Panthers, and the ire of opposing forwards. That responsibility left MacPherson staring down Oil Kings captain and signed Columbus Blue Jackets prospect Trey Fix-Wolansky through the first round of the playoffs. While the Central Division champion Oil Kings ultimately prevailed, MacPherson managed to hold Fix-Wolansky – who posted 102 points in 65 regular season games – to a single point through the first three games while preventing him from scoring a goal until Game 5. While his final year in the Gas City was cut shorter than desired, MacPherson says he will remember this year’s roster as one that held strong as a unit through a season filled with adversity.